This glossary gives a brief explanation of some basic terms commonly used in hemp and macrame jewelry patterns. Tip: Activated links will take you to instructions and diagrams. Butterfly Knot (BK) : A lacy knot (a.k.a. a picot knot). Cord and Twine: The technical difference between cord and twine is that cord is made with fibers spun in a counter-clockwise direction. Twine is made with fibers spun in a clockwise direction. In my pattern directions I usually refer to "cord" as a general term meaning any long stringlike material. Focal Bead: A big beautiful bead that takes centre stage in your finished jewelry. Fillers: (Also called anchors, knot bearers, carriers or bead carriers) In macrame, each strand or cord is a knotter or a filler. The fillers are the cords in the middle that the knots are tied around. They do not move when manipulating the cords to make the knots. See Fig. 1 on my Half Knot Instructions page to see an example. Half Knot (HK): A basic macrame knot using 4 cords. The outer 2 cords are "knotting" cords, or "knotters", and the inner 2 cords are "carrier" or "filler" cords. If a pattern says to use a "half knot", and doesn't specify right or left, it doesn't matter which one you make. Knotter: In macrame, each cord is either a knotter or a filler. 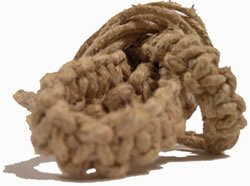 The strands of cord or twine you use to make the knots are called knotters. Left Half Knot (LHK): A half knot that is made by bringing the left hand carrier cord across the filler cords first. Left Square Knot (LSK): A square knot made by making a left half knot, then a right half knot, in that order. Right Half Knot (RHK): A half knot that is made by bringing the right hand carrier cord across the filler cords first. Right Square Knot (RSK): A square knot made by making a right half knot, then a left half knot, in that order. Overhand knot (OH): The most basic of all knots, this is essentially a half knot using only one cord. Picot Knot (BK) : A lacy knot (a.k.a. a butterfly knot). Sennit (or sinnet): A series of repeated knots. Square Knot (SK): A left half knot + a right half knot (in any order) form a square knot. Switch Knot: The term switch knot refers to switching the knotter and fillers with each other, thus forming a decorative transition knot. This also allows you to save some cording because your (usually) longer fillers become the knotters.